Located in the heart of Alice Springs, Todd Tavern offers budget accommodation with a TV and mini refrigerator in every room. The hotel’s bar includes a gaming room and bistro with outdoor dining area. Guests have a choice of rooms with en suite bathroom or with access to shared bathroom facilities. All rooms include tea/coffee making facilities, plus a table and chairs. Facilities include a coin-operated laundry and on-site liquor store. DJ’s Bistro offers comfortable dining in a relaxed and friendly atmosphere, with traditional pub meals and an à la carte menu. Todd Tavern Alice Springs is a 4-minute walk from the town centre's restaurants and cafes. 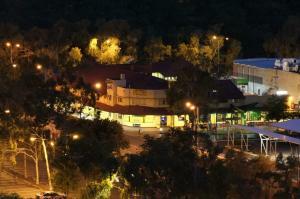 Alice Springs Convention Centre and Lasseters Casino are a 6-minute drive away.